Máté and János are both Hungarian students that were interested in the STEM field. By meeting with staff in the EducationUSA Office, they both decided that Purdue University was the place for them to pursue their graduate studies. 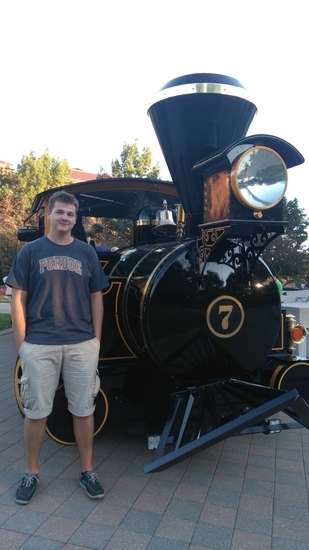 Máté had completed his time at Purdue by the time János decided to study there, and so the EducationUSA Office contacted Máté to ask if he would be willing to help János as he pursued the opportunity at Purdue University. Fortunately for János, he had guidance from both the EducationUSA Office and Máté during the application process. This mentorship concept is something that EducationUSA strives to continue as we work with more students who are attending Hungarian alumni institutions. Q: How did you hear about the Fulbright Program? How did you choose Purdue University? I learned about the Fulbright Program through a simple poster on a wall at my university. It made me curious, as I had never entertained the thought of studying in the US before. My choice to go to Purdue University was governed by the fact that the Hungarian Fulbright Commission just established a new Fulbright – STEM Student Grant at Purdue University. It was the first time I’d heard about Purdue, but after quick research on it I was convinced that it was the perfect place for me. Q: How did EducationUSA assist you in your educational goals? The people at the Hungarian EducationUSA Advising Center were very helpful from day one. They helped at every step of the application process. For example, they held several workshops free of charge to help with the essay or CV writing. They provided CDs and books for the TOEFL and GRE exams. Their help and encouragement were invaluable. Q: What was your experience at Purdue like? What are some things that you gained from being in the United States that you could not have gained in Hungary? My time at Purdue was every bit as awesome as I expected. The campus was beautiful and huge, practically the whole of West Lafayette (the town of the University) is only there to serve the university in some way. I’ve never felt lost at Purdue, if I was unsure about something (administrative paperwork, accommodation, course selection) I always had someone to turn to. The system of education for graduate students is vastly different in the US in comparison to Hungary. You have much more freedom in your MS studies. For instance, in my case I didn’t have to write a thesis to complete my studies and was free to select the courses that are most interesting and important to me. As long as your committee accepts your plan of study you can create your own path to the MS degree. Also, you can enroll in courses outside your department. This allowed me to learn about seismology which was very useful for me given my interest in seismic design of buildings. Q: How is your life different now as a result of Fulbright? Studying in a foreign country has its challenges, you must adapt to a new culture and a different education system. It forces you to move out from your comfort zone and gives you a secondary perspective on the world. As a result of Fulbright, you’ll become a lifelong member of an international organization of high-achieving people. This means that thanks to the alumni organizations you will get to meet with other Fulbright alumni, which is a great opportunity to network and to socialize. Also, it is a major advantage during job-search. Q: If you could give a piece of advice to fellow Hungarians interested in studying in the US what would it be? Don’t be discouraged by the lengthy and tiresome application process or the TOEFL and GRE exams. If you are truly determined to study in the US, with enough persistence you will accomplish your goal. Q: Why did you want to study in the United States? I wanted to study in the USA for two reasons. U.S. universities offer excellent education and are equipped with high-end, modern technology. Also, I spent several months in the USA during my childhood. This experience impacted me significantly. Q: What university are you at and what made you choose that university? What are you studying? I study in the School of Electrical and Computer Engineering (ECE) at Purdue University. I chose Purdue ECE because it has an exceptional graduate program. Also, Purdue has a strong diverse international community and a capable International Students and Scholars Office (ISS). Furthermore, I received help from a Hungarian Purdue alumnus, Máté Opoldusz. The Fulbright EducationUSA Advising Center helped me in numerous ways. Especially, I really appreciate Kornélia Litkei’s guidance and advice and Helen Shaw’s help. The institute provided me with the opportunity to take mock-tests and offered to lend practice material for a very low price. Q: How did the Hungarian Purdue alumnus, Máté, assist you in your educational journey to the US? After I showed interest in Purdue University, the EducationUSA Office gave me Máté Opoldusz’s contact information. From the beginning, Máté was very supportive and eager to help. He answered all of my questions in detail. He gave me the contact information of his friend at Purdue and explained how I could contact the West Lafayette Hungarian community. After I travelled to Purdue University he communicated with me for several months to follow up with my progress. Q: What has your experience at your university been like? What are some things that you have gained from being in the United States that you could not have gained in Hungary? Overall, I am having very pleasant experience at Purdue. The campus is beautiful and people are very friendly. I really appreciate that the whole program is practice-orientated. Classes are focused around projects and team work. 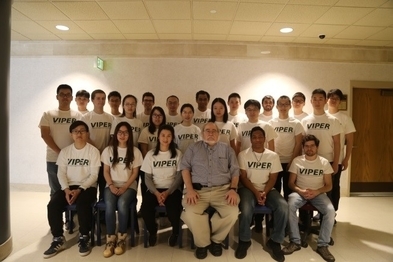 I joined Video and Image Processing Laboratory (VIPER), directed by Professor Edward J. Delp. In, the laboratory, I work with cutting edge technology and do research in image processing. Start planning as early as possible. Many people and organizations want to help you in your application, search for them. Q: Anything else that you would like to include? I received a lot of help through my application. I would like to thank the Fulbright EducationUSA Advising Center, Kornélia Litkei, Máté Opoldusz, my family and others for the help in my application. I would not be in Purdue University without their help. Ez a lap az Amerikai Nagykövetség, a Fulbright Bizottság és az Amerikai Kuckók együttmüködésével jött létre.